Where do the different cells and tissues in your body come from? Incredible as it seems, every cell was produced by mitosis from a small number of cells called stem cells. Stem cells are unspecialized cells that have the potential to differentiate—to become specialized in structure and function—into a wide variety of cell types. In early embryonic development, stem cells produce every tissue in the body. 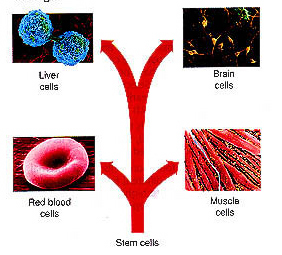 Evidence indicates that stem cells also are found in adults. Stem cells in the bone marrow, for example, produce more than a dozen types of blood cells, replacing those lost due to normal wear and tear. Although your body produces billions of new cells every day, it is not always able to produce the right kind of cell to replace those damaged by injury or disease. For example, the body is not able to produce new neurons to repair serious spinal cord injuries, such as those that cause paralysis. Because of this, at present, there is no way for doctors to restore movement and feeling to people who are paralyzed. Stem cells may be the perfect solution to this problem. Recently, researchers have found that implants of stem cells can reverse the effects of brain injuries in mice. There is hope that the same will hold true for humans and that stem cells might be used to reverse brain and spinal cord injuries. It also may be possible to use stem cells to grow new liver tissue, to replace heart valves, and to reverse the effects of diabetes. Human embryonic stem cells were first isolated in 1998 by scientists in Wisconsin. Many scientists are now experimenting with ways to produce such cells by transferring adult cell nuclei into the cytoplasms of egg cells. However, since these techniques use or produce early human embryos, they also raise serious moral and ethical questions. Because of such issues, embryonic stem cell research is highly controversial. Researchers have also found that nerve, muscle, and liver cells sometimes can be grown from adult stem cells isolated from the bone marrow and other tissues in the body. Experiments such as these, although still in the early stages of development, may usher in a new era of therapy in which replacement tissue is grown from a person's own stem cells.